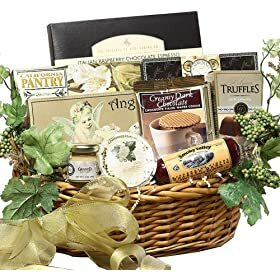 Impress friends, family or valued clients with this classic and elegant gift basket filled to overflowing with a grand selection of gourmet goodies – perfect for 2-4 guests to share. The medium basket is pictured above featuring the finest in Merlot Cheddar Flavored Cheese Spread, rich Italian Chocolate Espresso Cake, savory Italian Salami, Almond Roca Butter Crunch Cookies, decadent Belgian Chocolate truffles, Stone Ground Mustard, Sesame Crackers, Casse Croute Cheddar Crackers, and a Lady Walton White Chocolate Amaretto Cookie. Each gift is carefully hand crafted with attention to detail, tied with an elegant gold bow and includes a personalized gift message from you to convey your best wishes. Manufactured by Art of Appreciation Gift Baskets. TO DETERMINE WHEN YOUR GIFT WILL BE DELIVERED Please review Shipping Rates and Policies for VERY IMPORTANT information on how to calculate when your gift will arrive. *HOT* Ferrero Collection, 18 Count, Low Price! 22 Lovely and Yummy Heart-Shaped Treats for Valentine’s Day! Featured: Free premium templates and themes. Miracle-Gro AeroGarden 7 LED Indoor Garden with Gourmet Herb Seed Kit — $99.99 (reg. $199.95), BEST Price! *HOT* Grandma’s Big Cookie, Chocolate Chip, 2.5-Ounce Packages (Pack of 60), BEST Price!